Equestrianism is the only Olympic sport to team up athletes with animals and one of the few in which men and women compete on equal terms. Horse and rider work together for years to hone the skills required for these tests of agility, speed and grace. Chariot races and horse riding featured in the ancient Greek Games, and equestrian events made their debut in the modern Olympics at the 2nd Olympiad in 1900, when a high jump and long jump were held for the only time. In 1912 at Stockholm the competition began to resemble the one known today. Vaulting made a single appearance in 1920, but otherwise the Olympic programme has rarely varied and includes three disciplines - dressage, show jumping and three-day eventing - with individual and team competitions in each. In dressage, the horse is guided through a series of complex manoeuvres by slight movements of the rider's hands, legs, and weight. Medals are decided over three rounds. In the first two, the horse and rider must complete a set routine of dressage movements, including passages, pirouettes and piaffes in a walk, trot and canter. The third round is freestyle, and individually choreographed routines are performed to music. Dressage is like watching a horse perform ballet as it responds to its rider's subtle aids and signals. Judges evaluate how well the horse has executed the moves and score accordingly. The event has changed little since the Renaissance, when Neapolitan nobleman Federico Grisone founded a riding academy in Naples in 1532. The term dressage stems from the French word dresser, meaning to train, and European cavalrymen developed dressage for use on the battlefield and parade ground. Show jumping is more exciting to watch and easier to follow. It originated in Ireland, where fox hunting is a popular pursuit. The first jumping competitions were organised by the Royal Dublin Society in the 19th century. 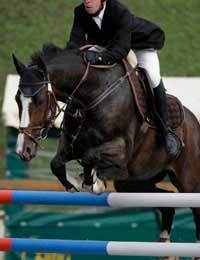 Olympic show jumping requires horse and rider to negotiate a course of about 15 obstacles, including triple bars, parallel rails, simulated stone walls and water jumps. Penalties are incurred if jumps are taken in the wrong order, if a horse knocks down a rail, refuses a jump, takes jumps in the wrong order or exceeds a time limit. Germany's Hans Günter Winkler was one of the finest Olympic show jumpers and is the only rider in any discipline to win medals at six different Games. His Olympic career began in 1956 at Stockholm, where he won individual and team gold on Halla. Four years later, Halla became the only horse to win three gold medals as Winkler added another team gold and, although Halla retired, Winkler went on to win team gold in 1964, bronze in 1968, gold in 1972 and silver in 1976. He is the only show jumper to win five gold medals and the only one to win seven medals in total. Three-day eventing combines dressage and show jumping and adds a third element - a cross-country course that tests horse and rider against the clock. Initially, Olympic eventing was restricted to military officers, although show jumping and dressage competitions were open to civilians. Women were allowed to compete in equestrian events at the 1952 Games in Helsinki and men and women have competed against each other since.